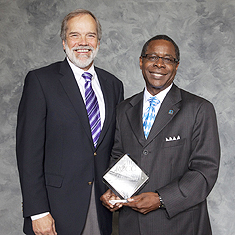 Mock trial squad wins Mid-Sout..
MTSU President Sidney A. McPhee is one of five recipients of the “Catalyst Award,” an honor from the Regents Online Campus Collaborative for efforts to make postsecondary education accessible online for all Tennesseans. As a result, the Regents Online Degree Program successfully launched in September 2001 and has grown from 1,048 students to more than 14,500 students in 2011. The program celebrated its 10-year anniversary at the Tennessee Board of Regents headquarters in Nashville Oct. 28. McPhee’s fellow Catalyst Award winners included R. Jack Fishman, a former TBR member; Dr. Dan Lattimore, vice provost of the University of Memphis; Dr. Ellen Weed, retired vice president of Nashville State Community College; and Dr. Robbie Melton, associate vice chancellor for the TBR. Campus Contact of the Decade—Doug Jameson, coordinator of online learning at NSCC. Each winner’s institution also receives a monetary award that can be applied to educational technology, course development or professional development. The Regents Online Campus Collaborative is an award-winning program that brings together postsecondary educational resources from the six state universities, 13 community colleges, and 27 technology centers located across the state of Tennessee. Through Regents Online, students can earn associate’s, bachelor’s and master’s degrees or diplomas and certificates from institutions in the collaborative. A video documenting the Catalyst Award winners’ roles in the startup and launch of the Regents Online Degree Program is available below.